I had seen variations on this recipe for ages and it always sounded disgusting – I mean, walnuts and canned green beans, really! Then I went to a cooking demonstration led by the wonderful Annabel Cohen. She made this dish and distributed the recipe. It was delicious! I’ve been making it ever since (modified slightly) and sharing the recipe. With a food processor, it’s very easy to prepare. In a large skillet, heat the oil and sauté the onions until they are golden brown. Add the walnuts and continue to sauté, stirring frequently, another 3 minutes or so until the walnuts are toasted (they’ll start to become fragrant). Remove from heat and cool for a few minutes. Put the onions and walnuts in the food processor with the canned green beans and process until smooth, stopping to scrape the sides of the food processor once or twice. Add the salt and pepper. Cut the hard-cooked eggs in half and add them to the food processor. Pulse just until the eggs are chopped; you’ll want to see little flecks of egg in the mixture. I got this recipe from a newspaper article on Rosh Hashanah foods, but it’s also great at Passover! Place the garlic and all but 2 Tbs. 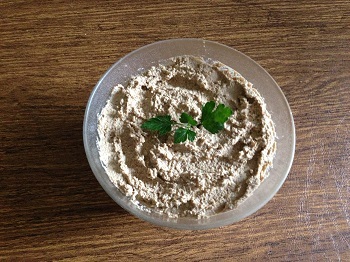 of the parsley in the bowl of a food processor and chop well. Add the carrots, lemon juice, orange juice, olive oil, salt and pepper. Pulse until the carrots are chopped into small pieces but not pureed. 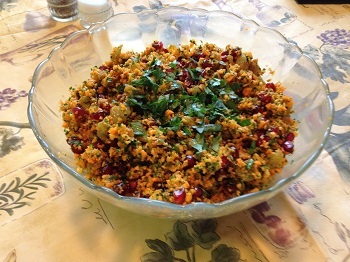 Mix with raisins and pomegranate seeds and sprinkle with reserved parsley. This is obviously not a Passover recipe — but there’s a connection! I was cleaning out my freezer for Passover and discovered a huge cache of my husband’s homemade challah (a subject for a future post!). We keep lots of not-kosher-for-Passover foods over the holiday, putting it away in a cupboard we don’t use for that week and actually selling it (via our rabbi) to someone not Jewish. But we never keep bread — the quintessential forbbiden food — over Passover. But I couldn’t bear to throw away one large and two small loaves of perfectly good bread! 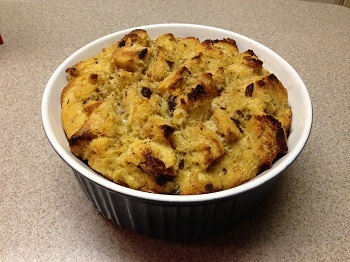 My solution — bread pudding, which I love any time of the year. With so much bread, I made a large one, so we’ll be enjoying some yummy breakfasts (and maybe some desserts) between now and Monday. The only downside was that I didn’t have time to let the bread get really dried out. Usually I let the bread cubes sit in a bowl on my counter for a good few days before I make bread pudding. This is almost more of a method than a recipe, because you can change it in so many ways. You can reduce the size of the pudding easily by reducing the ingredients proportionately. 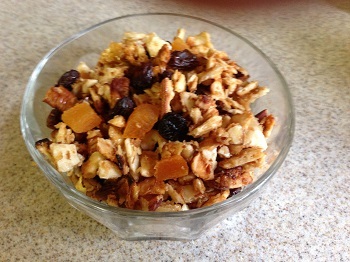 You can change the flavor by using different dried fruits (e.g. cherries, apricots) or by adding chopped fresh fruit (e.g. tart apples, pineapple, peaches, blueberries). You can even add chocolate chips or chopped nuts. You can substitute maple syrup for the brown sugar. You can substitute almond extract for the vanilla. Beat the eggs, and then beat in the milk, brown sugar, vanilla, cinnamon and salt. Pour the custard over the bread cubes and mix well so the bread is completely soaked. Mix in the raisins. Turn into a greased baking dish, and dot with butter. Cover the dish and refrigerate overnight or for at least a few hours. Preheat oven to 350 degrees and remove baking dish from refrigerator to come to room temperature. Bake, uncovered, about an hour until the pudding is puffed and golden and a knife inserted in the center comes out clean. Cool at least 15 minutes before serving (the pudding will sink a bit). Serve hot or at room temperature. Hooray, I made a recipe last week that can be used on Passover! But you don’t have to be kosher-for-Passover or even Jewish to enjoy these delicious almond cookies. This was the first time I made them with cardamom, because I don’t have kosher-for-Passover cardamom. It gave the cookies a very pleasant, distinctive flavor. I also make them without the almond flavoring for the same reason. I planned to add it this time, since it wasn’t Passover yet and I have lots of almond extract in my pantry — but I forgot! During Passover, I often add a bit of cinnamon to the mix. If you use a food processor to grind the almonds yourself, pulse it in short bursts. You want the almonds to be very finely ground, but you don’t want them to turn into a paste! I usually splurge and buy packages of ground almonds, even though that’s a lot more expensive. 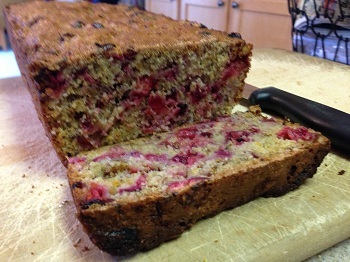 This is adapted from a recipe in The Jewish Holiday Cookbbook by Gloria Kaufer Greene. Whip the egg whites until they turn white and start to increase in volume, but not until stiff. Stir in the sugar and mix well, then mix in the remaining ingredients. The “dough” will be a very thick paste. With moistened hands, form small balls and place them on ungreased baking sheets about 2 inches apart. (You might want to put parchment paper on the baking sheets to make it easier to remove the cookies.) Flatten the cookies slightly with moistened fingers. 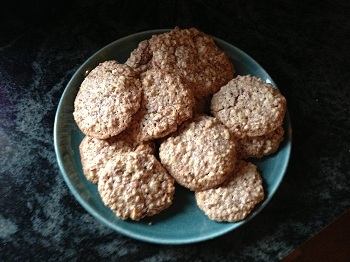 Bake for 15 to 20 minutes, until the cookies are firm and very lightly browned. Use a metal spatula to remove the cookies from the baking sheets (I’ve found turning the spatula upside down is helpful here) and cool on wire racks. I knew I had a recipe for sour cream apple squares – but I couldn’t find it in my card box, my accordion file or my manila folder, where my hundreds of recipes are stashed, and it’s not the kind of thing I would have gotten from my cookbooks. Thank goodness for the Web! I found this recipe on a site called Taste of Home. The unidentified person who contributed it claimed to have invented it in the 1950s with her mother. I didn’t think it was the same recipe but a few days later I was going through my recipe box and found my original Sour Cream Apple Squares recipe – which was exactly like the one I got from the Web, except that I could tell I cut it out many years earlier from a package of Pillsbury’s Best Unbleached Flour. 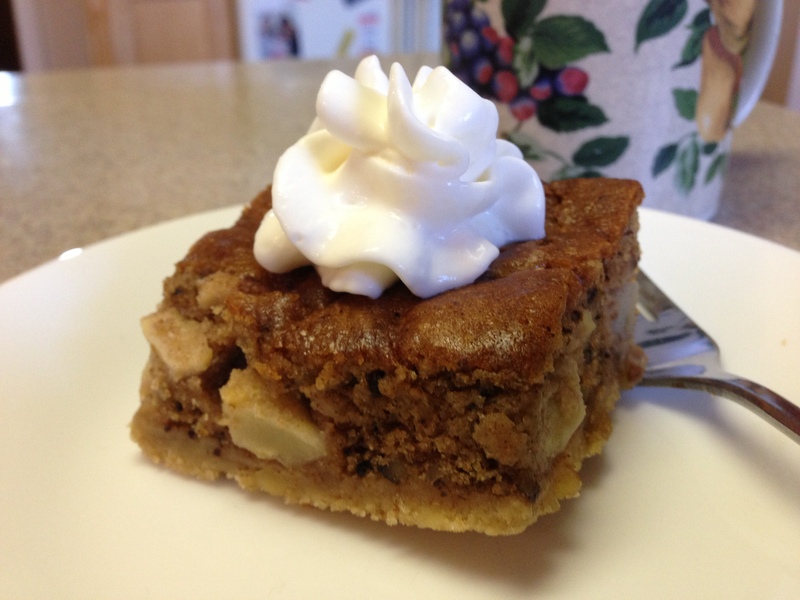 No matter, it’s a delicious recipe, with a nutty, crunchy base and soft, apple-y top. In a large bowl, combine the flour, brown sugar and butter, and beat at low speed until even, small crumbs are formed. Stir in the nuts. Press about 2¾ cups of this mixture into an ungreased 13 x 9-inch baking pan. To the remaining crumb mixture, add the cinnamon, baking soda, salt, sour cream, vanilla and egg. Beat until thoroughly combined. Stir in the chopped apples. Spoon this mixture over the crust. Bake at 350 degrees for 35 to 40 minutes until a toothpick inserted near the center comes out clean. Cool and cut into squares to serve, garnished with whipped cream or ice cream if you like.